Thank you to Shire for providing support for this website. Millions of children are living with pediatric digestive and nutritional disorders. GIKids provides easy to understand information about the treatment and management of these pediatric digestive conditions for children and parents. We welcome you to explore GIKids to learn more about pediatric digestive disorders, how they are diagnosed, the treatment and management of conditions, and our patient and parent resources. The NASPGHAN Foundation is providing resources guide on all of our Constipation resources developed by NASPGHAN, CPNP and APGNN. The purpose of the guide is to improve the quality of life and avoid complications in constipated children through early diagnosis and prompt, effective multidisciplinary treatment. Visit our Constipation page to view these resources. 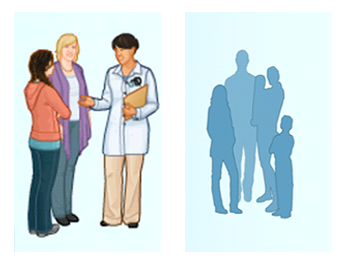 Understanding your child's treatment options for Crohn's just got easier. Crohn's disease can be a difficult condition to manage and understanding all the different treatment options can be confusing. To help you and your child's health care provider find the right option for you, watch the video Treatment Options for Pediatric Crohn's: A Guide for Patients and Families. It walks you through options available and explains the possible risks and benefits of each option so you can make an informed decision that you're comfortable with. Support provided by AbbVie,Inc. and Janssen Biotech, Inc. Capsule endoscopy is a procedure that allows the doctor to examine the small intestine by using a tiny pill sized video camera inside a capsule that is swallowed. As the capsule moves through the digestive tract the camera takes thousands of pictures that are recorded on a sensor belt that is worn by the patient. Learn about capsule endoscopy by watching Cappy's animated adventure through the the intestine. If your child is having problems with soiling accidents (encopresis, “poo accidents,” “poo-ing” in pants), you’re certainly not alone. This is one of the most common problems seen by both pediatric GI and primary care providers. This interactive animated video explains what causes the accidents, why they happen so often, and how we can treat the problem. Watch the video, developed by APGNN member Becky Kendall, NP, from Childrens' Hospital Colorado, supported by an educational grant from the NASPGHAN Foundation. If you would like to become part of our transition referral list, please complete this information.